← Celebrating the Invisible. Reweaving Returns to Richmond. But his story got me thinking. Can a bowtie be elegant? Not a starched, piqué white tie or a grosgrain black tie, but a regular bow tie? They certainly used to be more prevalent as the illustration of our man about Paris above reveals. I’ve worn a bowtie twice in the last week. That’s a lot for me. But midwinter calls out for a bit of lighthearted fun — a dash of colour to brighten a grey day or a bowtie to celebrate the clinic-bright sunlight. At least on occasion. 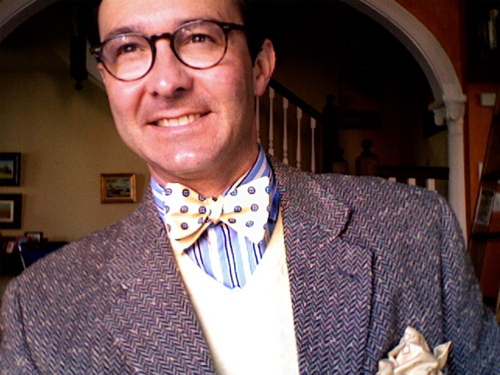 The first day I wore a blue on blue spotted bowtie to see a matinée performance of the Richmond Ballet. Yesterday, it just seemed like an easy thing to toss on and all the bright yellow was cheering. The gentleman, photographed by The Sartorialist on MONDAY, FEBRUARY 13, 2006, is very well-dressed, at least in my opinion. (The photos are copywritten. Please visit the site and search “The Costume Designer.”) His mix of colour, pattern and texture (I’d love a fur collared coat, but what a look to pull off!) is spot on. Speaking of spot on, when we think of bowties, doesn’t this gentleman, who forsook the Old Boy look, spring to mind? Spots and stripes are a classic and conservative combination. Do you often wear a bowtie? 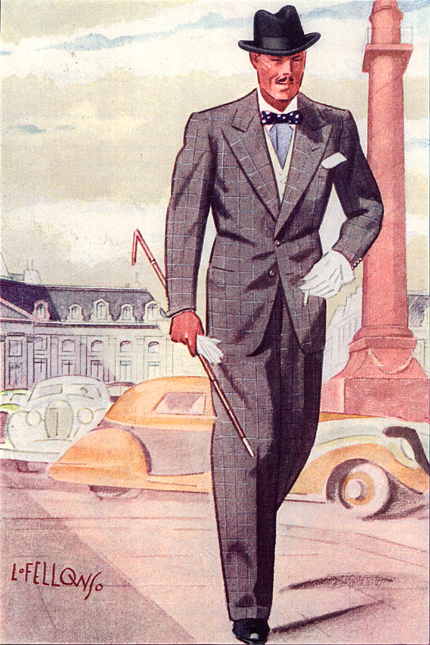 And do you find them more whimsical, or more elegant than the four-in-hand? 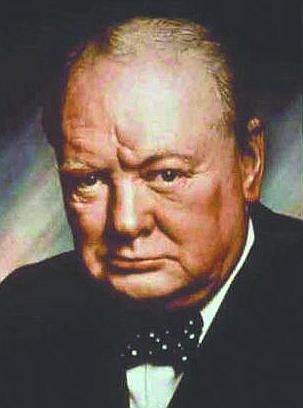 This entry was posted in Elegantology and tagged Apparel Arts, bowtie, Sir Winston Churchill, The Sartorialist. Bookmark the permalink. The dotted bowtie is completely charming against the stripes and tweed! It made me laugh, it looked so happy! My dear husband wears one – and when he does, I know he is feeling dapper. I do love them so. They are like a smile or an exclamation mark! You have done quite well. Especially by keeping the shirt covered with your coat and vest. I, as DD says, do like the yellow bowtie with the striped shirt. Nice loo. Because bowties are the exception to the world of ties, I believe they are considered more remarkable overall, and thus, more subject to both praise and approbation compared to the four in hand. At my govt. law office, I usually get at least one comment and several looks. It’s not the item for the shy and withdrawing type. Politically speaking, I think it has been the flagstaff of both extremes: George Will and other conservative pundits are countered by liberal Senators Pat Moynihan & Paul Simon and countless tweedy college professors. I just think they’re fun; and the simple shoelace knot takes me back to my days waiting tables. However, I forego it for important trials and hearings: its too chancy to create a flippant first impression, or run across an anti-bowtie jurist. My father used to wear a bowtie when I was young as did his father before him. So, my views on a bowtie are that they are very correct. In reality, he was a physician in a lab and back in the day he appreciated the fact that it stayed out of chemicals and samples – it was, quite simply, practical. I am now an architect and men in the profession used to often wear bowties as they were less likely to be stained by ink …. and architects actually used to wear suits and ties to work everyday (which is sadly not true today). I love your mix of patterns – something my WASPy father never would have attempted – very stylish. And you are so right – the bowtie is the perfect bit of zing during the dark and deary end of winter days. The perfect seasonal touch. I have a closet full of four-in-hand ties that have never been worn but I wear my bows nearly every day. My only effort to dress down and follow the “business casual” code (I’m not that old but I can’t put business in the same sentence as casual) is to substitute an ascot or neckerchief for my bows and an odd jacket and trousers for a suit. IMHO, subtle dark or neutral bows can be quite elegant. If you want a splash of color, a properly sized bow in an interesting color or pattern can be quite festive. I like this better than a four in hand for color as the smaller size is more accent than bold statement. I attend several committee meetings per month and surprisingly, on several occasions, every man in the room was wearing a bow tie. As a junior Wall Street analyst fresh out of Yale in the early 1980s, I frequently wore bow ties to the office until my boss took me aside one day and instructed me to “never” wear a bow tie to the office again. He said that it was inappropriate for the world of high finance and I wouldn’t be taken seriously if I continued to wear one. I was rather startled, since my college professors (and father) wore them, but I complied. I never got rid of them, though, and my collection of circa 1975-1985 bow ties is now a happy hunting ground for me to choose among as I have resumed wearing them, but only on weekends at my country house. I feel natty when wearing one, and enjoy the slack-jawed stares I get from those who haven’t seen one since the Mr. Whipple ads went off the air. 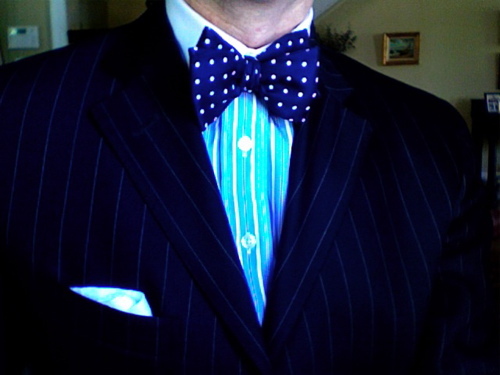 I like the simplicity of the blue and white polka dot bow tie – tied with what Ian Fleming called ‘Churchillian looseness’. Apart from evening ties, most other bow ties introduce an element of levity into one’s dress. This may or may not be appropriate, depending on the circumstances. Ooooo — I just LOVE the truly dapper dots of your bowtie! Simply charming — and does add a dashing touch! It’s hard not to smile looking at those dotted bow ties. I completely agree with Turling. Bow ties always look much better with a large swath of fabric extending down and away. I especially like the look with the vest. And, is that a perfectly unstudied tuft of pocket square I see? My son, a recent college graduate and current law school student, enjoys wearing bowties from time to time. As a child of children of children (etc. etc.) of the South Carolina Lowcountry, he has a pretty good sense of style. ah…bow ties. i work at a relatively casual job, with adolescents with mental health issues….and i love my bow ties. You asked if they can be elegant, and i say yes…but they also are plain fun. They are whimsical when worn casually, and people smile. Especially when they make the assumption that it is a pre-tied and I assure them it is not. a) I’m gonna use the word NATTY all the time now, thanks to your blog. b) I only know how to tie a bow tie. I can’t do a regular tie.